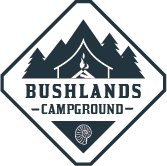 Located in the middle of the Forgotten World Highway (SH43), is the Bushlands Campground, offering a paradisaical setting. 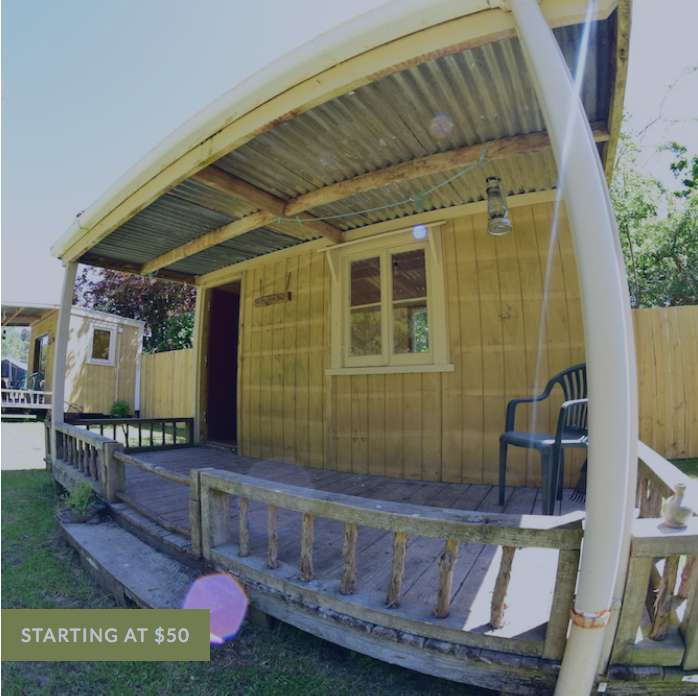 The campground is situated on the banks of the Tangarakau River, 6km down the Raekohua Road, in a lush green valley dotted with native bush and manuka. This spot is very peaceful and definitely ‘away from it all’. Offering powered and non-powered sites, as well as the freshly refurbished rustic cabins. It’s time to swim in the river, relax by the open fire or cook in the wood fired pizza oven. There is no phone or internet coverage, so its time to unwind, spend time with friends and family and get away from the pressures of everyday life. Slow down, relax and enjoy the amazing beauty of the surrounding landscapes. 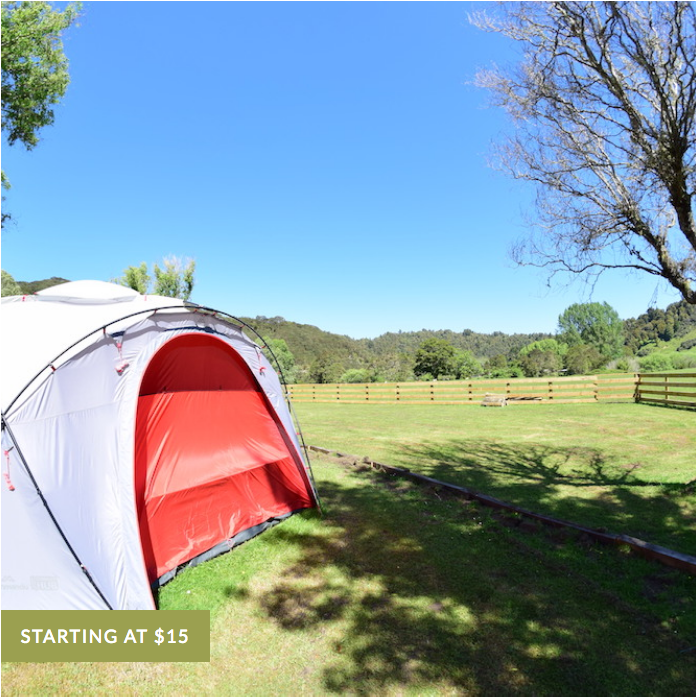 Surrounded by native trees, hear the trickle of the Tangarakau river and the call of native birds, our non-powered sites are dotted throughout the campground, so whether you want to be nestled under a tree or positioned overlooking the river, the choice is yours. Six powered sites positioned to take in the landscapes and vistas of the area. Advanced booking for groups or peak times such is recommended. Open areas, plenty of space and nature at your doorstep with a wide range of activities in and near the park. Use of the main facilities is included. Refurbished and rustic cabins that are the epitome of the lifestyle in these parts of the wood. Freshly re-clad, new beds and bedding will ensure you have a great nights sleep. Each cabin has its own deck to enjoy an evening wine, watching the sunset and listening to the river babble in the background. Flowing through the Tangakarau Gorge, the river offers plenty of opportunity for trout fishing, rafting and swimming holes for a dip on hot day. There is a beautiful relaxing walk along the river, where you can listen to birdsong and soak nature in its most pure form. With an impressive cliff face of fossilized rock, the 12 km long Tangarakau Gorge offers an amazing insight into the geological and natural history of New Zealand. 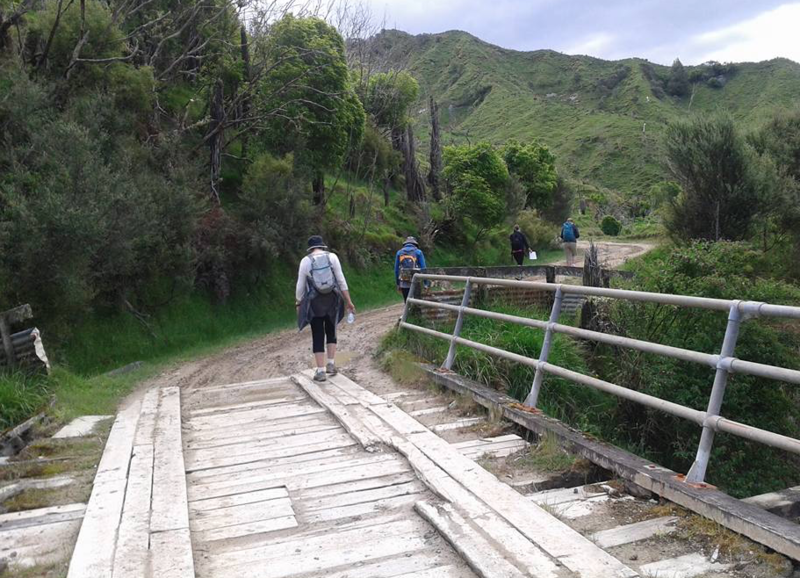 Return walks from the campground take you along the Tangarakau River to the start of the Gorge. A hike up to the top of Mt Pouatu is definitely worth the effort. A well formed track ascends through farmland and native bush to reach the top where the views of the surrounding area is simply breathtaking. On a clear day the view of Mt Ruapehu is stunning! From the campground, there are many hiking opportunities. 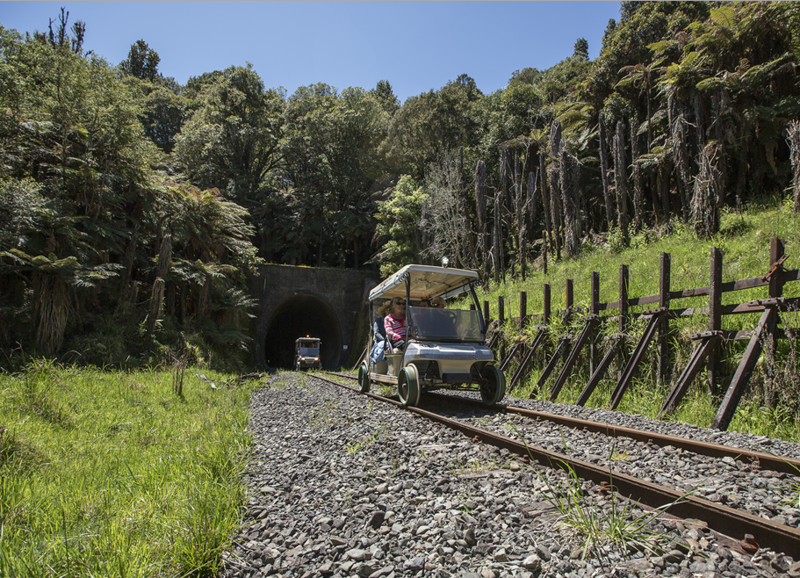 Explore the start of the Tangarakau Gorge with its beautiful canyon, and the historical train tracks and tunnels. There are numerous scenic reserves and tracks in the surrounding region. 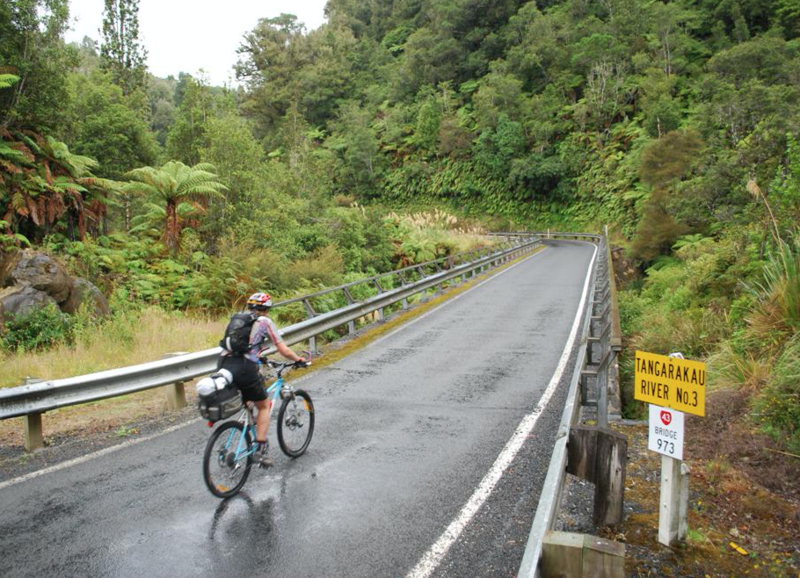 Whether it is cycling the winding road through the Tangarakau Gorge, the peaceful gravel side roads through native bush and manuka or mountain biking on purpose built tracks in the district, the opportunities for cycling in this area are endless. Forgotten World Adventures offer a very unique way to experience the historic train tracks, on their custom built pedal and battery powered golf carts. There is no better way to experience history and landscapes than this. Please inquire for more information. Tangarakau was at one time the second largest town in central Taranaki. 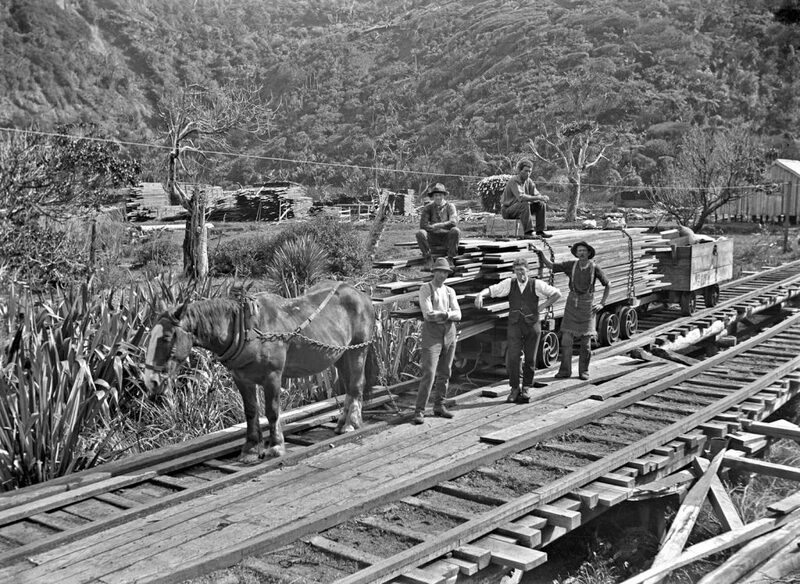 Tangarakau’s heyday was from the early 1920s until 1937, when the population peaked at 1200 people. At its peak, the school had 140 pupils, every house had one lightbulb and the town even had street lights. Electricity was provided through a 32-volt DC power plant, which was steam driven and powered by coal from the Tangarakau mines. The town boasted a sports field and had nine sports teams, including cricket, rugby and hockey. There was even a women’s hockey team. Two All Blacks, Jack Sullivan and Bob Scott, were born in the town. However, as the need for workers declined after the construction of the railway, people started to leave for brighter pastures… hence the locals now call it the Ghost Town! The only original building still standing today is the school. We do not currently offer transportation services. However, in the peak periods, for a price, we can provide transport to and from the Whangamomona Hotel, so you can enjoy a meal and a tipple or two. Please inquire for more information. There are no minimum stays requirements. What activities and attractions are there? 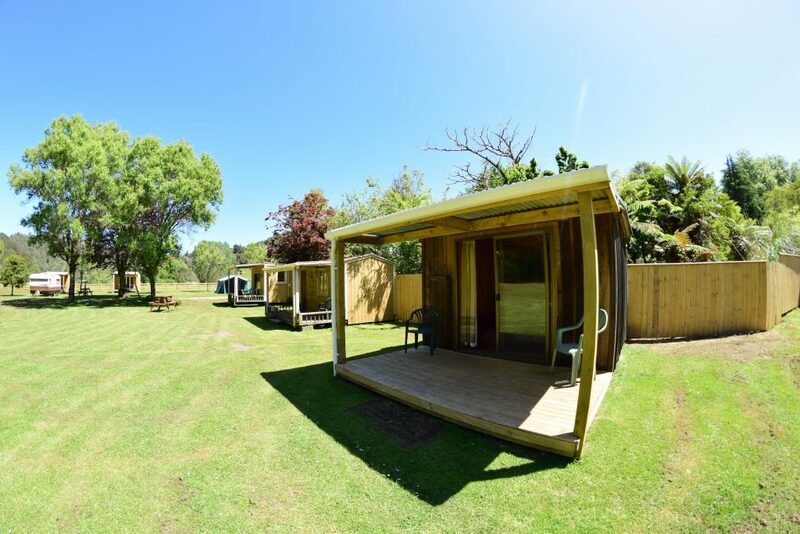 There are plenty of activities and attractions, both at the Bushlands Campground and in the surrounding areas. Bushlands offers walking and hiking opportunities, farm experiences and a great river to be explored. Within the district, there are a wide range of activities from museums to mountain biking. Located in the middle of the Forgotten World Highway (SH43), Tangarakau is 1 hour 20 minutes drive from Stratford at one end and Taumarunui at the other end. However, there is no rush, with so many amazing views you will find yourself stopping to pull out the camera! Relax and take your time and enjoy the real New Zealand. Click here for directions using Google Maps. Is there a working beehive there? There will be a purpose built viewing hive there soon. Pouatu Honey produces high quality Manuka Honey and Native Bush Honey in the valley, from their 600 beehives. We welcome people to come and view the process of producing our honey. What farm experiences are on offer? 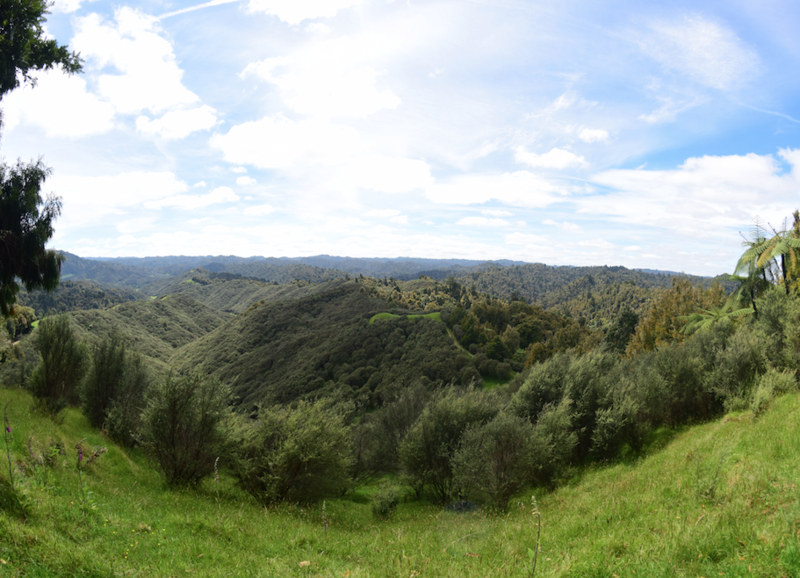 Stroll across the farm, walk along the river, visit the spectacular canyon. See the sheep and cows grazing and at certain times of the year, watch the sheep being shorn. We are happy to point you in the right direction, so you can experience heartland New Zealand at it finest. What hiking is available in the area? There are many walks around the farm and surrounding areas. 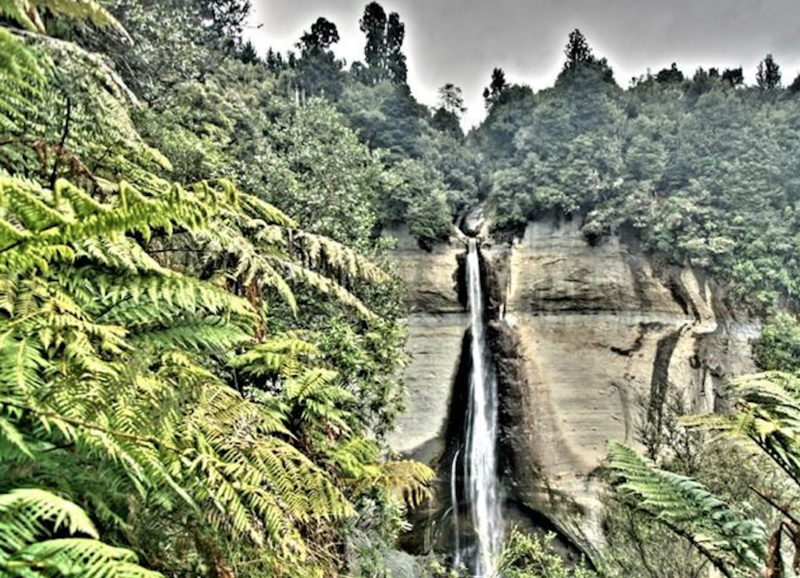 A 40 minute stroll (each way) up the Tangarakau river brings you to an amazing canyon layered with ocean fossils. This walk is flat and follows the abandoned narrow gauge railway, which was used to haul coal from the mines, down into the township to fire the power station. 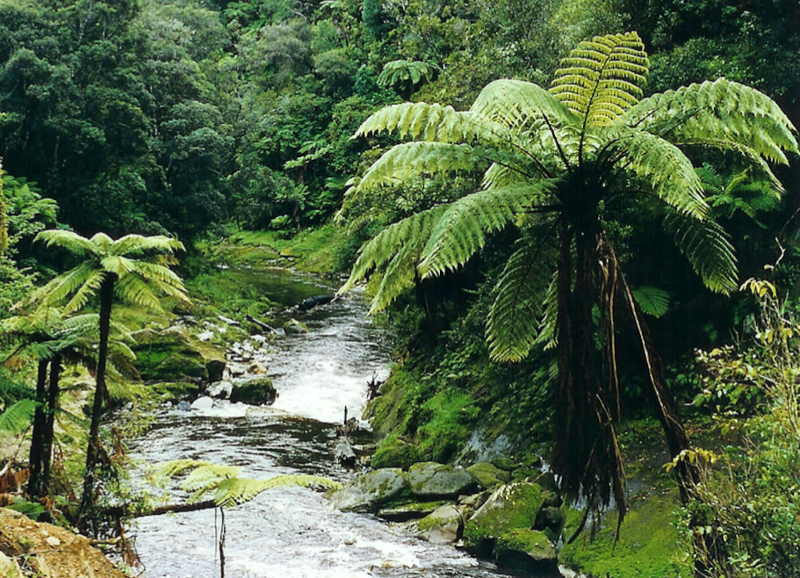 See the real New Zealand bush and abundant wildlife. A longer walk will take 3 hours return to the top of Mount Pouatu. From the top on a clear day the views of Mount Ruapehu, Ngauruhoe and Tongariro are breathtaking. Be sure to take some water with you. What about cycling and mountain biking? The Forgotten World Highway is an internationally renowned cycle trail. The entire length of 148 km can be cycled, or sections of it to make for a trip that lasts from several hours to several days. Where are the shops, pub and restaurant? 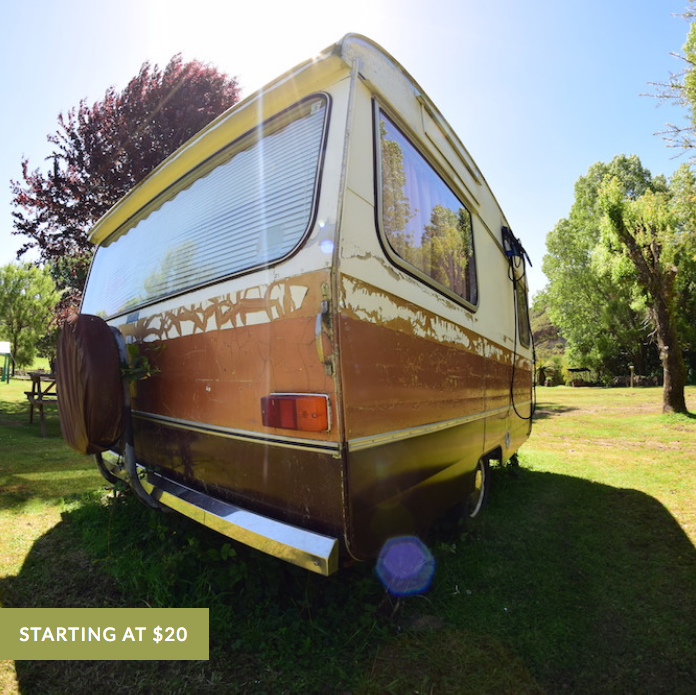 Approximately 20 minutes drive from Bushlands Campground is Whangamomona, which boasts the famous Whanga Pub offering great food and a relaxing place to enjoy a beer. The closest shops are in Stratford and Taumarunui, at either end of the Forgotten World Highway.